Another girl enters Leng Xue’s life! Previously on The Four… catch up with episode 14 recap! *ASG = An Shi Geng. The Ji household welcomes a legendary doctor who happens to be Papa Ji’s old friend. Yao Hua visits home and this doctor pulls her aside to ask her about her health. She reveals that she is terminally ill from the injury she sustained when she saved Leng Xue. The doctor urges her to quit her job and stay home to rest, if not herself then at least for the sake of her father who already lost her mom. Yao Hua rejects the idea because it has been her dream to uphold justice as a detective. Unable to convince her, the doctor agrees to prescribe her some more medication to maintain her health. While she is at home, Yao Hua’s father also pressures her to get married, specifically to Leng Xue. 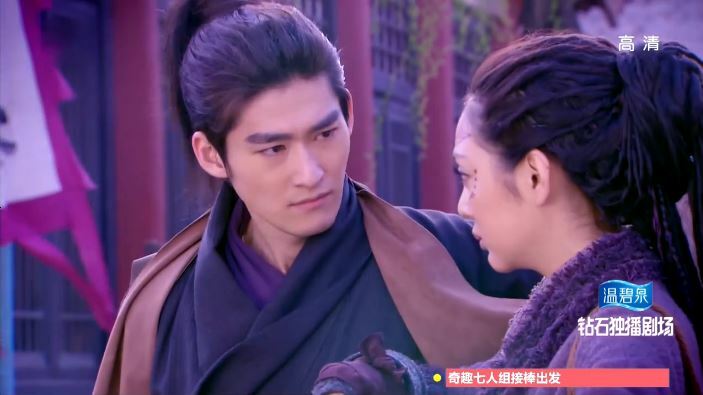 Yao Hua replies that things are still very busy at Shen Hou Fu, so they must postpone any plans for marriage. my dream is for you and leng xue to get married and give me a grandson! Back at Shen Hou Fu, the Four, Zhu Ge and Li Mo figure out that the Wen father and son are behind the mysterious potion. In addition, they are aware that the potion needs the blood of 49 girls. While they know who can make the potion, they are unsure why the Wen family would need the royal stamp. Li Mo does bring up the fact that she recognized Chun Tong as the person scattering powder in front of Leng Xue’s residence before. Speaking of Chun Tong, he successfully acquires the right to “investigate” the case of the lost royal stamp because the Six Door leader is now weak and reliant on opium. In a flashback, we learn that ASG saw Ru Yan on the street one time and because she looked exactly like Die Wu (aka his lost love), he thought Die Wu must have sent Ru Yan to him. So in order to get Ru Yan to marry him, he holds her family hostage. Great plan. Way to win a girl’s heart! Without any choice, Ru Yan marries him, but their married life turns out to be a complete torture for the both of them. 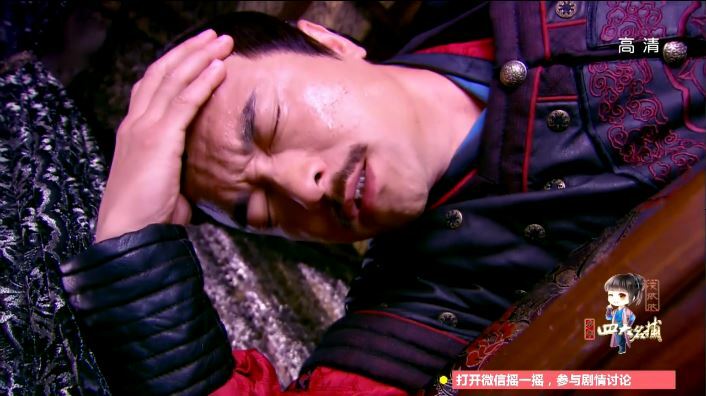 Ru Yan continues to miss Wu Qing and ASG is obsessed with molding Ru Yan into Die Wu. A lot of things are happening on the streets this episode! Leng Xue finally happens upon Nu Nu while out and about. I mean, she is kind of hard to miss, with all those facial marks and what not. After they learn who each other is, Nu Nu admits to attempting to assassinate Leng Xue’s foster father, who she thinks wiped out the wolf tribe. Leng Xue does not believe her, so she pulls out the broken piece of jade pendant and shows him how it looks like the pendant of his foster father. Still unconvinced, Leng Xue tells her they must deliberate further and he will avenge the tribe when they find out who that person is. However, Nu Nu disregards Leng Xue’s warnings and tries to kill his foster father again, but luckily he stops her in time. Unfortunately though, Nu Nu decides that Leng Xue is no longer fit to be the prince of the wolf tribe and that she alone now has to uphold the honor of their kind. Oh dear. This is not going to end well. oh hello, we are from the same tribe! ASG has another sad crying sequence. Because Yi Yi jumped out of nowhere to bother Tie Shou, he is unable to track down Wen Ru Yu even though he saw Wen come out of a apothecary. Tie Shou tells Yi Yi that she cannot help him and will become his burden if she tags along since she does not know martial arts. Later on, Wen Ru Yu spots her as she mumbles about what Tie Shou said. 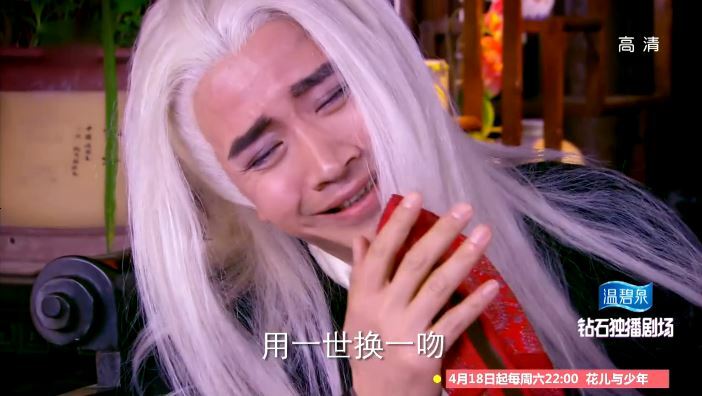 Wen Ru Yu offers to teach her martial arts moves and Yi Yi happily accepts. Uh-oh.